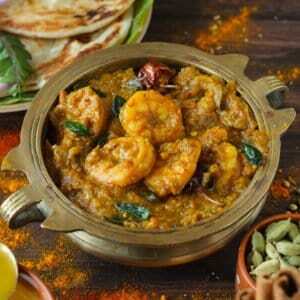 Chettinad Prawn Masala is a finger-licking good South Indian style prawn curry. It is spicy, bold and perfect to serve with steamed rice. The best of this prawn masala is the outburst of real Chettinad flavors. So far one of the best ways prawn recipes I have tried in the recent times. 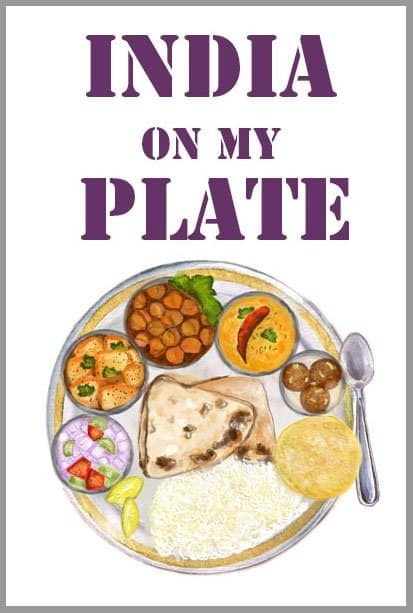 This epic South Indian curry takes no time to get ready and is indeed a treat for the culinary senses. One of the signature characteristics of any Chettinad Curry is the masala. I am in love with the fragrant, flavorsome, fiery Chettinad masala. What I like most about this South Indian curry paste is that it is pretty simple to prepare from scratch at home. All you need is quality whole spices, red chilies, and a few other essential ingredients. Just roast, blend and the freshly made Chettinad masala is ready for the curries. It is worthy of all the effort. If you are looking for an authentic taste, then try using the best available ingredients to make the curry paste. Like, the whole peppercorns instead of black pepper powder, bright and crisp dry red chilies, and of course the fresh curry leaves. Altogether these ingredients create the gorgeous Chettinad masala. In case you are wondering about the spiciness of this curry paste, then don’t! Either remove the seeds from the red chilies to lessen the heat in the curry paste or reduce the number of chilies and peppercorns. You can totally customize the spiciness of the Chettinad curry paste. A splash of coconut milk can also be added in the curry to calm down the hotness. Talking about the prawn masala, it does not take more than 30 minutes to get ready. What’s not to love about Chettinad Prawn Masala? It’s like all my favorite things, simmered in one pot – prawns, Chettinad masala, mustard oil and loads of spices. We have totally embraced South Indian style prawn masala into our everyday meal menu. And now since I have moved to Chennai, I am sure prawn masala is going to make a frequent appearance on my weekly menu. Whether it is the traditional Chicken Chettinad or prawn masala, both of them are my lunch favorites with a heap of steamed rice and tomato garlic rasam. The combination is an absolute foodgasm kinda experience. 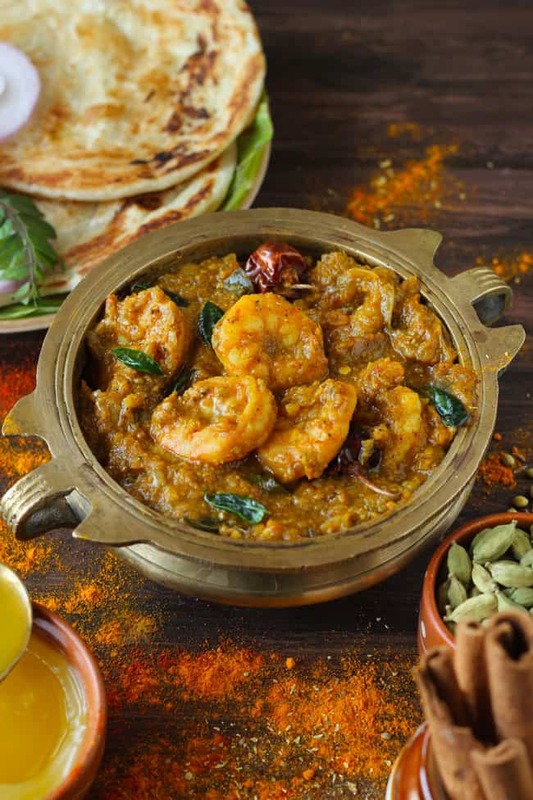 If you’re a seafood lover, making your own Chettinad Prawn Masala from scratch is a must try dish. 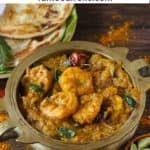 It is the kind of prawn curry that makes you jump with glee because it is very close to the authentic version of the dish. 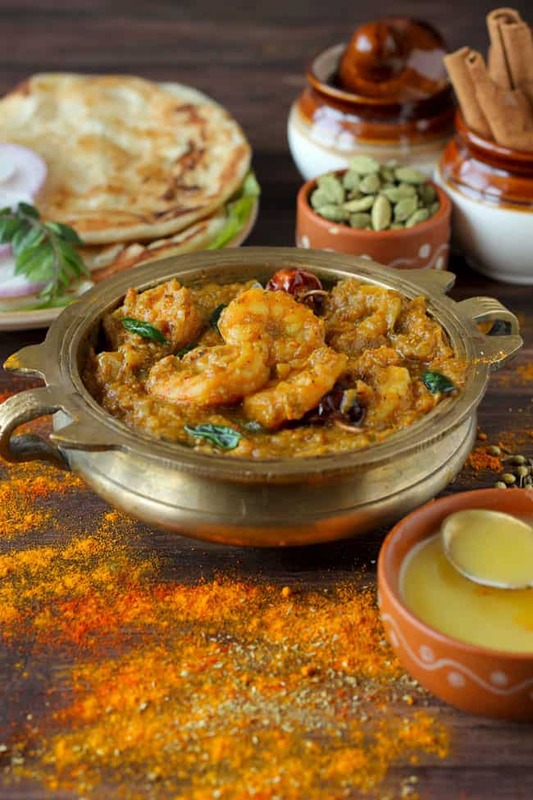 Chettinad Prawn Masala is a finger-licking good South Indian style prawn curry. Learn how to make prawn masala in a few simple steps. To prepare Chettinad Prawn Masala, first wash, clean and devein the prawns. If possible, use the pre-cleaned prawns. Dry roast fennel seeds, black pepper, cumin, red chilies, coriander seeds till fragrant and slightly darkened. Grind them in a mixer to a smooth paste using little water. Add turmeric and ginger - garlic paste to the freshly ground spice mix. Stir to combine and set aside in a bowl. Heat oil in a large kadhai over medium heat. Add the cinnamon, cardamom pods, curry leaves and saute for few seconds till fragrant. Add the chopped onion and saute over low heat till onion is light brown. Next, add the tomato puree and fry the masala for 10 minutes or so over low heat. The indication of masala being ready is oil starts separating from it. Now add the Chettinad paste to the fried onion and stir to combine. Continue to saute the masala scraping the bottom of the kadhai, till the masala takes deep brown color and nicely roasted. At this stage add the clean prawns, salt and stir to combine. Turn the heat to low and cook the prawns 10 - 15 minutes. 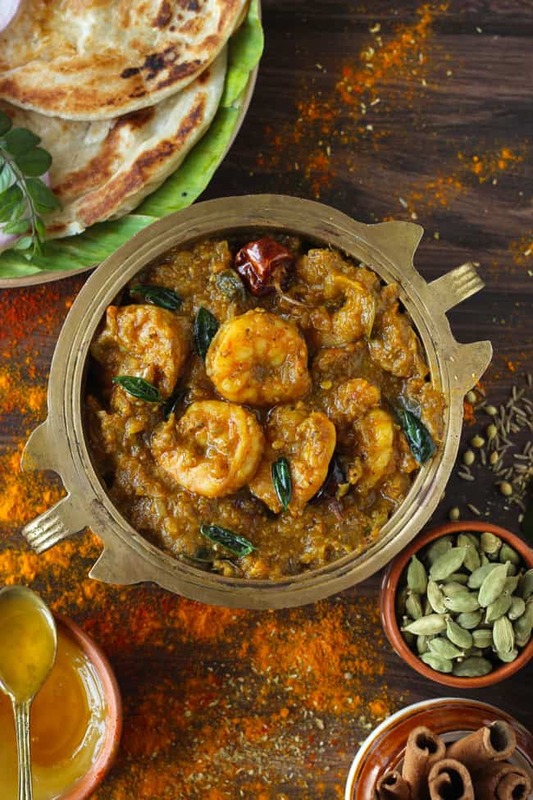 Serve Chettinad Prawn Masala with lachha paratha, steamed rice, and tomato rasam. You can use frozen prawns as well to make Chettinad Prawn Masala. Do not cook the prawns for too long as they might turn chewy. Adjust the number of chilies in the Chettinad masala paste and curry as per your taste preference. My mouth is drooling when I look at your prawn curry.